Now comes the fun part: putting your homebuilt computer together! Here's my step-by-step, illustrated guide to how to assemble a computer. After days, weeks, or months of planning your homebuilt computer project, it all comes down to the next few hours when you will be assembling that pile of parts that's been sitting on the table (but hopefully not collecting dust) into your very own homebuilt computer. Once you've gathered all of your components, tools, and manuals together, have found a good place to work, and a supply of your favorite beverage, it's time to assemble your new computer. The pages that follow describe the major steps in assembling a "typical" home built PC. It's a bit dated, but the basic principles are still the same. Still, every computer building project is a little different. Take a few moments to look at your particular computer and plan for yourself what is the best sequence to use. For example, the design of your particular motherboard and case may make it easier to install the components in a different order than the order that appears here. That's fine. Do whatever makes the most sense. This site is a guide, not a rule book. Also take a moment to review the safety and anti-static precautions before going any further. Few things feel quite so bad as ruining a part of your homebuilt PC because of failure to protect it against static discharge. 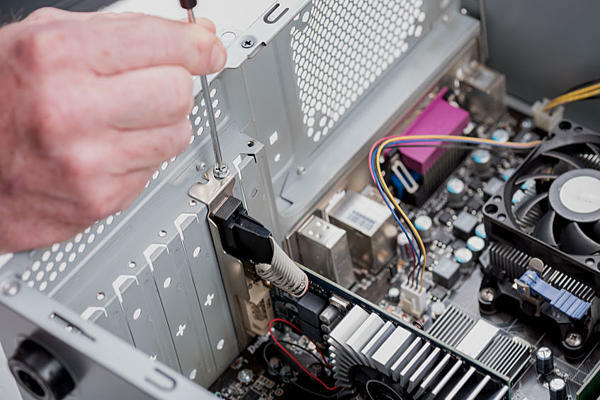 It should go without saying that ALL COMPUTER ASSEMBLY MUST BE PERFORMED WITH THE COMPUTER UNPLUGGED FROM THE AC POWER. But my lawyer insisted that I say it anyway. So there. It's been said. My lawyer also wanted me to mention that this site is intended for adults and that young people need to be supervised by an adult when attempting a computer-building project. So if you're a kid, make sure you have an adult review your plans and help you assemble your new PC. And have fun! This computer was designed by my brother to enable him to work remotely from home and run standard desktop applications. He didn't need blazing power or high-end audio, so he chose an affordably priced barebones computer kit with integrated audio. But because he occasionally manipulated graphics, he wanted a decent video card. He chose an ATI Radeon card with 128 MB of onboard video RAM, which was pretty high-end at the time. Nowadays, it would be laughable. In fact, it wouldn't be able to run a lot of the applications we use today at all. But for the time, it was a pretty high-end card. And because he needed to connect to his office domain to work from home, he chose Windows XP Professional as the Operating System. Back then, XP was the newest version of Windows, and XP Professional was the only version of XP that could connect to a Windows server domain. Take a swig of whatever beverage you're drinking, and put the cup down far away from where you are working. Liquids and computers don't mix. Now take a deep breath, stretch a little, and let's start assembling your homebuilt computer.